Most will be able to give the answer and will understand it as when sufficient revenues are achieved to cover all costs and profitability is reached. I am not going to cover any technical aspects of break even, since there are enough articles written about break-even points and how to calculate them given different variable and fixed costs. Instead, I set out some key points for entrepreneurs when considering how to break even. 1. Set the right price – this is critical to any business plan and if it’s too low, you’ll have to sell a lot more and won’t impress any investors’. If the price is set too high, the volume may be lower but it may not be sustainable. 2. Get the right time frame – getting to break-even as fast as possible should be the target but not easily achieved. Expect to break even within 2 years for most businesses and for ones with high start-up costs the time frame will be longer. 3. Be careful with fixed costs – keeping fixed costs such as premises, set up, salaries, support services etc will help break-even faster and easier. Higher fixed costs mean that a business can be prone to losses when sales have a down turn. 4. Manage variable costs – these are the costs that are directly related to the sales and have to be carefully managed on a day-to-day basis. Negotiate with key suppliers to get the right costs since increasing the margin per unit can dramatically reduce your break-even point. 5. Get the niche right and cross sell – if you can target niche markets and add complementary products to your main product, you will reduce your break even point significantly. Think Apple or BMW! 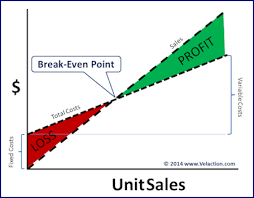 The main objective should be to reduce your break even point and to achieve higher profits. The above tips are to manipulate the key components of the break-even formula to the benefit of your business. Also, don’t forget that there could be multiple break-even points in the life of a product as new versions come out and more costs are incurred to bring out these new versions. To be on top, a business must focus on break-even all the time.